It is my intention to give the readers a better understanding of what we do to maintain The Farms Country Club's 18 hole championship golf course and grounds. Green Aerification Begins on Wednesday! The course will be closed Wednesday and Thursday for green aerification and overseeding! It is that time of year and the turf certainly needs some love. Mid to late August is when our turf, especially Poa Annua, is at its weakest point. The turf has performed well all summer and under the most trying weather conditions, but we are seeing the effects now. You may have noticed thinning turf and brown patches. Our goal is to provide firm fast playing conditions and we have done well reaching this goal. Poa Annua on greens and collars are showing the late summer signs of stress yet the creeping bentgrass still looks excellent! The scheduled aerification and overseeding will definitely help stressed turf recover. It is also the perfect time to continue our plan of introducing the more desired creeping bentgrass through overseeding. 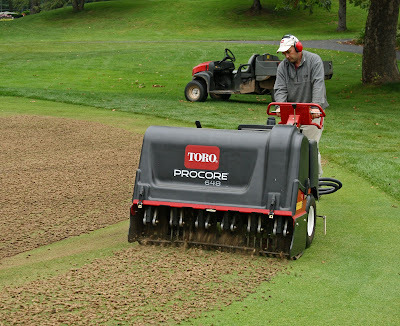 The greens will recover within the normal two week period after aerifying and we can enjoy the expected fine playing conditions through the home stretch of the season! Some of the brown spots in fairways are the result of us not over watering turf and allowing isolated dry spots to go dormant. If we over-irrigate to reduce the isolated dry spots, most areas of the fairways would be soaked and playability would suffer. The brown areas are only dormant and will recover as cooler temperatures and better growing conditions arrive in the coming weeks. I will keep you updated on our progress over the coming days. Thank you for your patience while we perform one of our most important maintenance tasks! I urge you to catch up on the last couple of USGA Green Section Northeast Updates discussing what they are seeing in the region. Where Are The Hits Coming From? Head Golf Professional, Jim Hanlon, Joins Maintenance Staff! New Divot Repair Mix Hits The Course! Drill & Fill Aerification Today! Wildlife Photos From The Course!